Jo Lindsay Walton: How do you like that apple? Jan Pierewiet, Jan Pierewiet, Jan Pierewiet staan stil. Goeie môre, my vrou, hier's 'n soentjie vir jou. 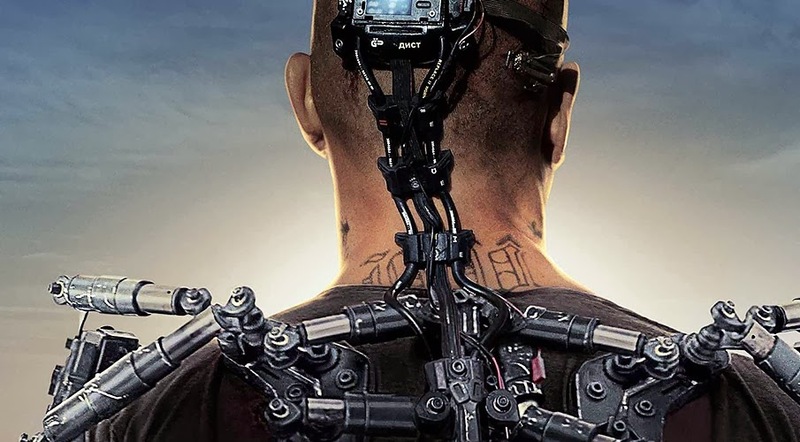 Goeie môre, my man, daar is koffie in die kan.
Elysium is a big science fiction blockbuster which tries to be as clear in its allegory as possible. In a smart review over at Tor.com, Tim Maughan talks about how Elysium allegorises "denial of universal healthcare, dystopian immigration policies [...] the ever-growing gap between the rich and poor," and, in particular, drone warfare. Elysium, of course, also sounds a lot like asylum. Talking over the film recently with @HMittelmark and @PrinceJvstin, the point arose that, whatever you think about allegorising the real injustice we do have, and about allegorising the more just social order we could have (go for it, I say! ), allegory has a really tough time knowing how to represent the transition between the two. In Elysium that gap in the allegory, not surprisingly, doesn't remain empty. Instead it organises itself into theology. Max Damon is Christ. Spoiler alert: at the end of the Gospels, Christ dies, so that everyone else can be saved. What's really striking is how strongly the iconography of Elysium supports this. A little before Max's final sacrifice, the camera even lingers on a ribbon of blood streaming from his hand. Then there's Max's exoskeleton. It is hard not to read this as a powered, articulated version of the True Cross. Unbelievably, Max even has a kind of nimbus or halo. It's slightly cropped in this pic. If that glowing blue interface had been circular it would have made the association even stronger, although there are examples of square halos, usually denoting that the holy person is still alive. Christ himself often has a cross in his halo, and sometimes some words. Whether Christ's halo is touchscreen is unknown. Of course, Max isn't the only one in an exoskeleton that sports such an interface -- although interestingly, Kruger's halo get plucked out during the War in Heaven, shortly before he gets cast down to his fiery doom. "Will it hurt?" asks Max. The identification of the exoskeleton with the True Cross lends a particular reverence to the scene in which it is screwed into Max's body. I wonder if, given the large amount of theological reflection involving spiritual movement towards or away from Christ, and perhaps involving entrance into Christ; and given the devotional tradition of the Sacred Heart, which pinpoints Christ's divine love more precisely in His chest; and given the equally meticulous and controversial study of the physical arrangements of the Passion (e.g. Jehovah's witnesses interpreting the word stauros as "stake" rather than "cross,"), there is any theology uniting these topics? And if so, what would that theology make of Elysium's shift from the movement of the nails, perpendicular to Christ's heart, to the movement of the screws, both perpendicular and (in the turning of their helix threads) towards and away from His heart in many minuscule twisting trajectories? Anyway, I suppose to a secular watcher, all this iconography produces a kind of back-and-forth tussle. Does the allegory about universal healthcare, drone warfare, and systemic and direct violence against refugees get captured by the theological allegory, and therefore turned into mystical hokum, into weak, wishful thinking? Or does the theological allegory get captured by the allegory about universal healthcare, drone warfare, and refugees -- drawing on a force which has shaped culture and ethics for centuries, and bringing it to bear on specific, unmistakable policy issues?